Bioremediation, a rapidly changing and growing area of environmental biotechnology employing microorganisms, presents a potentially more effective as well as economical clean-up technique than conventional approaches. The combination of several remediation techniques are considered to improve the remediation results especially in sites with complex contamination, as most traditional methods do not provide acceptable solutions for the removal of wastes from soils. The combination of electro kinetics with bioremediation, nanotechnology, biofilms, phytoremediation, chemical oxidation or electrical heating, presents interesting perspectives for the remediation. It is expected that the combination of these technologies will expand the dimensions of the remediation process to improve the remediation results, saving energy and time. Employment of new techniques is the need of the hour to carry forward this novel technology from its embryonic stage to all its developmental stages providing it with promising attributes to address some of the grave challenges faced by our environment today. The quality of life on mother Earth depends to a large extent on the overall quality of the environment. In early times, there was a belief that there was an unlimited abundance of land and resources; today, however, the resources in the world show our carelessness and negligence in using them. The problems associated with contaminated sites now assume increasing visibility in many countries. Contaminated lands generally result from past industrial activities when awareness of the health and environmental effects connected with the production, use, and disposal of hazardous substances were less well recognized than today. The problem is worldwide, and the estimated number of contaminated sites is on rise. It is now widely recognized that contaminated land is a potential threat to human health, and its continual discovery over recent years has led to international efforts to remedy many of these sites, either as a response to the risk of adverse health or environmental effects caused by contamination or to enable the site to be redeveloped for use. The conventional techniques used for remediation have been to dig up contaminated soil and remove it to a landfill, or to cap and contain the contaminated areas of a site. These methods are non economical and old. Through such methods, the contaminants are transported elsewhere and may create significant risks in the excavation, handling, and transport of hazardous material. Additionally, it is very difficult and more expensive to find new landfill sites for the final disposal of the material. The cap and contain method presents temporary solution since the contamination remains on site, requiring monitoring and maintenance of the isolation barriers long into the future, with all the associated costs and potential liability. A promising approach than these traditional methods is to completely destroy the pollutants if possible, or at least to transform them to innocuous substances. Some technologies that have been used are high-temperature incineration and various types of chemical decomposition (e.g., base-catalyzed dechlorination, UV oxidation). They can be very effective at reducing levels of a range of contaminants, but have several drawbacks, principally their technological complexity, the cost for small-scale application, and the lack of public acceptance, especially for incineration that may increase the exposure to contaminants for both the workers at the site and nearby residents. Bioremediation is an option that offers the possibility to destroy or render harmless various contaminants using natural biological activity. As such, it uses relatively low-cost, low-technology techniques, which generally have a high public acceptance and can often be carried out on site. Sustainable ecosystems can be designed to eliminate environmental toxins and reduce pathogen loads through the direct and indirect consequences of plant and microbial activities. Contamination of soils, groundwater, sediments, surface water, and air with hazardous and toxic chemicals is one of the major problems facing the world today. Nature has its own way of cleaning the environment by removing xenobiotics to maintain a perfect balance but in this era of industrialization the rate of xenobiotic discharges has crossed the tolerance limit of the nature. Therefore, there is a need to find out the method of remediating xenobiotics from the environment. Microbial remediation of xenobiotics has proved the effectiveness and low cost technology but there are several limitations in using microbes. It has long been recognized that microorganisms have distinct and unique roles in the detoxification of polluted soil environments and, in recent years, this process has been termed bioremediation. Bioremediation is a soft bioengineering technique to clean up contaminated lands/sites using microbes (bacteria or fungus), plants (terrestrial and aquatic) and earthworms. It is also a technique to stabilize the eroded lands and prevent soil erosion. Bioremediation works carried out by the microorganisms are called ‘micro-remediation’ while those performed by plants are called ‘phyto-remediation’ (Figure.1). Earthworms have also been found to perform some environmental cleaning jobs and are termed as ‘vermi-remediation’. Recent advancements have also proven successful via the addition of matched microbe strains to the medium to enhance the resident microbe population's ability to break down contaminants. Microorganisms used to perform the function of bioremediation are known as bioremediators. The objectives of the article are to provide the historical background in the field of bioremediation and environmental management by exploiting potential of indigenous microorganisms. 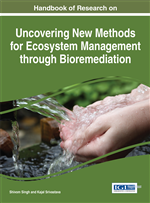 The chapter also deals with the recent developments in the field of bioremediation.